Bri Gaal's Blog: Do you wear a watch? Do you wear a watch? If you do, you are old. Yup, apparently, watches aren't cool and young people don't wear them. 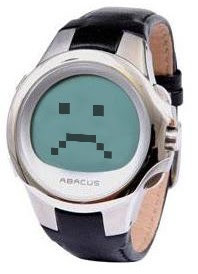 This watch is sad, but is he sad because I said he was uncool? Or is he sad because he just realized that only old people wear him? Notice I made the watch male since I'm the blogger. Blogger = woman = cool = not making watch a woman. Or more simply, male = uncool = watch. For what it's worth, I wear a watch. I've worn one since I was a kid and feel completely naked without one. It's used for keeping time, as a stopwatch, as an alarm, and occasionaly as a timer. It has many uses! Unlike a toaster which is a mostly useless appliance since it is large and can only do one thing, but I digress (we do own a toaster, I just think they are stupid). I first read about this uncool watch phenomenon back in March, while visiting our friend, Kathy. She had a tongue-in-cheek book about how not to act old and this was one of the items on the list. Apparently, most young people use their cell phones as clocks nowadays. Marty got further confirmation of this coaching the high school cross country team. He wants his kids to wear a watch so they can track their splits during workouts but most don't wear them. He finally relented and told them they had to have some sort of time piece. About half wear watches and the other half.....hold their cell phones! While they're running - they time themselves with their cell phones. I think that's uncool. Little whippersnappers. Hrrumph. hahahaha. ray started xc and his coach does not want him to wear a watch! That must mean I am only sort of old, because I only wear a watch when I run and when I race, and otherwise I just look at my cell phone. Well, I have to say.. I do use my cell phone. But OF COURSE.. I don't use it to run / take splits etc. The big old expensive Garmin or Polar has to do that for me! I would be lost without them on a run or ride for sure! Although, it is kind of nice at the end of the season / during the off season to be completely "time" free.. no watch, no heart rate.. no feedback.. just breathin the air! I feel you Bri! That's a little crazy! My high school kids are definitely split on wearing watches. Some are really into the feedback (and actually a couple have GPS watches). While others look at me as if I have three heads when I ask if they have a watch to wear for their run.